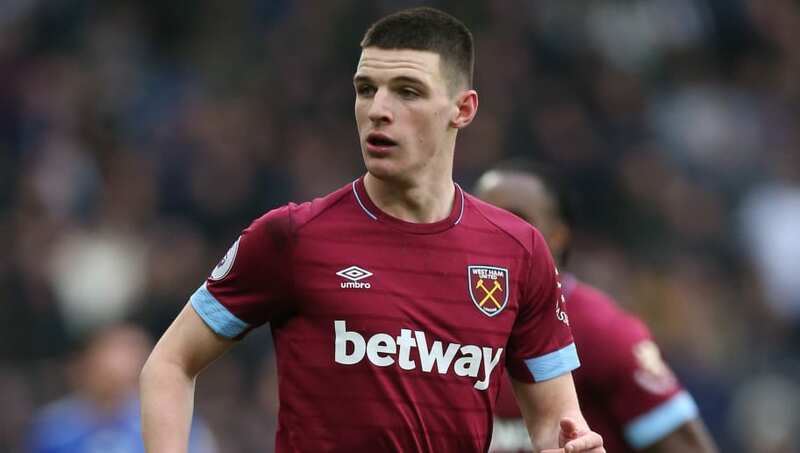 ​Manchester United are prepared to splash the cash in order to sign Declan Rice from West Ham, according to a report. The 20-year-old has burst onto the scene this season after putting in a series of impressive performances in the anchor midfield role, earning his first international caps with England, as well as signing a new five-year deal at the London Stadium. That contract commits Rice to West Ham until 2024, but speculation over a move away from the club has been rife for a number of months - with a number of Premier League clubs rumoured to have interest in snapping him up. One club who have been linked strongly linked with Rice are ​Manchester United, and it's claimed by the ​Irish Independent that the Red Devils will 'break the bank' in order to bring him to Old Trafford. ​West Ham have absolutely no desire to sell Rice, but manager Manuel Pellegrini did admit last week that his side may be forced to sell him if a "big team pay an important amount of money". Such a move would seemingly re-invent the transfer wheel at United, with Ole Gunnar Solskjaer's appointment as permanent manager perhaps an indication that the club will now turn to investing in youth - rather than splashing the cash on tried and tested performers, which has been the ethos and philosophy of previous managers Louis van Gaal and Jose Mourinho. That ideology brought a great deal of success to the club during Sir Alex Ferguson's 27-year reign at the club, and it's thought that Solskjaer's appointment, coupled with the return to the club of former assistant manager Mike Phelan, has seen the Scotsman's way of thinking return to the forefront of the minds of United's board. ​Borussia Dortmund's Jadon Sancho is another exciting young prodigy who fits this particular transfer billing, so a move for Rice is not out of the realms of possibility. West Ham, though, will undoubtedly be keen to ward off United, and any other interested parties, in favour of building their team around Rice. The lure of playing for one of the biggest teams in the world may prove too much though, with a summer saga of 'will he, won't he' likely to ensue over the coming months.